It’s time for managing spring turnout this month. Spring has sprung and green pasture is coming on like gangbusters in most parts of the country. For most of us, this is good news because green grass relieves some pressure of searching for quality hay at a reasonable price. Of course, with the rising cost of fertilizer, it may be hard to decide which is the lesser of two evils: high-priced hay or high-priced fertilizer. 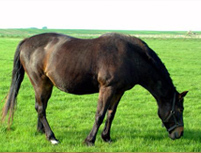 However, if you have pasture and intend to utilize it for horses, there are some things to consider. This entry was posted on Tuesday, March 19th, 2019 at 8:27 pm	and is filed under News & Updates. You can follow any responses to this entry through the RSS 2.0 feed. Both comments and pings are currently closed.